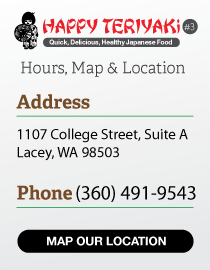 Happy teriyaki in Lacey, WA 9850. We invite you to make reservations and join us for your next dining experience. Fresh romaine and napa cabbage, topped with crunchy noodles, sliced almonds and our creamy ginger “LOVE” dressing. Fresh Asian napa cabbage, topped with crunchy noodles, sliced almonds and our own special light sesame oriental dressing.